Geoff TAYLOR was the longest serving President of AHARS and spent over 14 years at the helm. Geoff commenced as AHARS President in February 1991 and continued until his untimely death in June, 2005. Geoff’s interest in amateur radio followed on from a career in the electric and electronic fields, where he worked for about 40 years as a technical officer in the Electricity Trust of South Australia (ETSA). Geoff rose to a senior position within the Test and Standards Laboratory of ETSA. 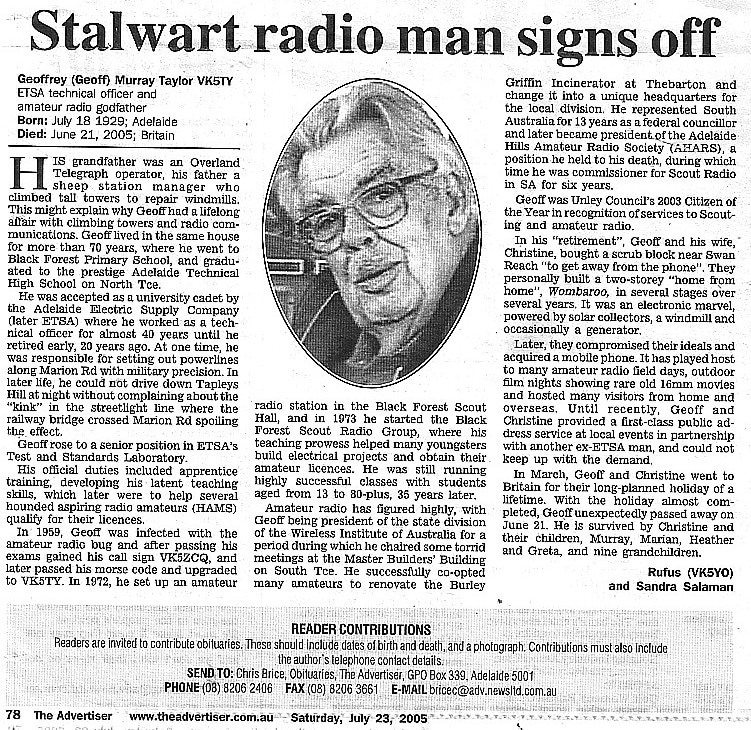 Some of his official duties included apprentice training and no doubt this gave him the urge (and experience) to run a training course for radio amateurs. Geoff was the President of the WIA South Australian Division between April 1972 to April 1974, and also served as a Federal Councillor for the SA Division for around 13 years. He was granted WIA Life membership in 1988. He ran classes from his home to prepare aspiring radio amateurs for their examinations. He prepared a set of technical papers which could be used as reference to study for the exams. 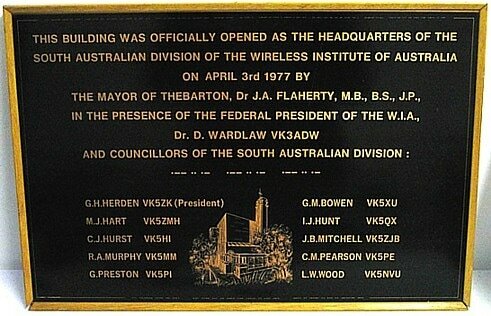 He was for a time the Director of the Wireless Institute Emergency Service Network (WICEN). In 1972 Geoff started the Black Forest Scout Radio Group and his interest in Scout Radio continued to the point where he filled the position of Commissioner of Scout Radio in South Australia for six years. He continued this interest right along to the time when he became President of AHARS and for a few years he arranged for AHARS to get involved in the yearly Scouts Jamboree of the Air (JOTA). Geoff was instrumental in establishing the Burley Griffin building at Thebarton was a suitable headquarters for the SA Division of the WIA. Geoff was awarded the Unley Council Citizen of the Year in 2003, in recognition of his services to scouting and amateur radio. Interests other than amateur radio included collecting vintaged items of electrical and radio gear, and Geoff also ran a public address system to provide sound for many local events. Whilst the President of AHARS, Geoff continued to support some of the well established AHARS yearly events such the November Electronics Sale, but also introduced a number of new events. Geoff and his wife Christine owned a property named 'Wombaroo' near Swan Reach, and each year whilst the John Moyle Memorial Field Day was in operation, Geoff would invite AHARS members up to Wombaroo to take part in the Field Day under the club call sign of VK5BAR.